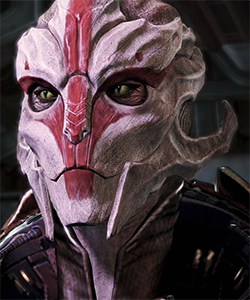 Nyreen is the first female turian to be seen in the Mass Effect series. She first appears in the Omega DLC for Mass Effect 3 as a squad member that Shepard can recruit into her party. Nyreen's reasons for being on the remote Omega station remain unknown until she reveals that she is actually the current leader of the Talons, one of Omega's more powerful mercenary groups. Nyreen is at first reluctant to join forces with the more chaotic Aria but eventually agrees to an alliance in order to save the people living on Omega from Cerberus' tyranny. Nyreen comes from a family with a long and prestigious military history. Well into her military career, she began to manifest biotic powers -- abilities that allow the generation of protective barriers, levitation and to tear enemies apart. Those possessing biotic abilities are an extreme rarity among the turian species. As turians are not generally biotic in nature, most officers in the military are suspicious of working with biotic individuals and prefer to ship them off to specialist units called Cabals. Despite being happy in the position she held at the time, Nyreen's commanding officer shipped her off to one of these Cabal units. It was here that Nyreen found her skills and expertise going to waste; she was put in a position where she could not use her abilities to help her people. With deep regret, she decided to quit her military career. Military life was likely all that Nyreen had known for a long time and now that she was no longer with the military, she felt lost. She would spend several years wandering aimlessly, not entirely sure what to do with her life. Nyreen eventually ended up on Omega where she met Aria T'Loak. As Aria better trained Nyreen in her biotic abilities, the two eventually formed a relationship with each other. Although they cared for each other, the relationship would eventually end due to their personalities being so different from one another. Aria believes Nyreen to have left Omega, but the turian would secretly remain on the asteroid and become the leader of the Talons. 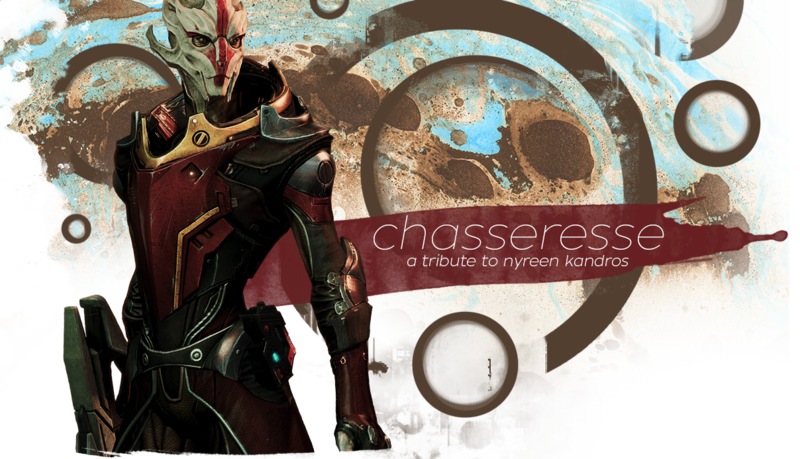 As an individual, Nyreen is incredibly selfless and valiant. She often tries to reign in Aria's more chaotic nature by encouraging her to consider Omega's citizens, rather than blindly start shooting without caring who gets in the way. She has a generally high code of ethics and goes to great lengths to protect those who cannot protect themselves.